Bradford City caused a Carling Cup first round shock by dumping Championship Nottingham Forest out. Four-time winners of the tournament Forest took the lead when Matt Thornhill fired in Chris Cohen's cross. Jon McLaughlin made several saves for Bradford and they levelled after the break when David Syers turned the ball in after good work from Jake Speight. Nathan Tyson hit the post for Forest and Bradford won it in extra-time when sub James Hanson scrambled home. Hanson's finish in the 100th minute came after Lee Camp had saved Simon Ramsden's low right-foot free-kick and proved enough to book League Two Bradford's place in the second round. But they have McLaughlin to thank for a series of top-drawer saves, including one from Tyson and one magnificent sprawling stop at the feet of Dexter Blackstock. Tyson also fired wide with only McLaughlin to beat as Forest, missing five players on international duty, slipped to their second defeat of the season. "I thought in the first half we showed too much respect to them, and I thought we were a bit quite, but in the second half we had a real go. "I think they realised that the first half wasn't good enough and so it was nice when they responded in that way in the second half. "I think the boys will be going home tonight looking forward to not doing much tomorrow, and we've got a win against a very good team." "You cannot have the chances that we had in front of goal hit the target. We train every single day. We work on crossing and finishing exercises every day. "Yes, it's difficult with players playing out of position, yes we've got a young side which I've thrown together, but it's a great opportunity for some of these players. "The bottom line is the amount of chances that we missed is unexplainable." 120:44 The match gets underway. 120:00+0:51 Defending throw-in by Garath McCleary (Nottm Forest). 120:00+0:10 Goal kick taken long by Jon McLaughlin (Bradford). 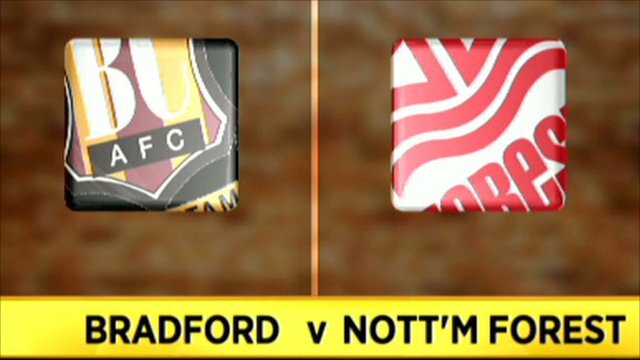 119:08 Foul by Dele Adebola (Nottm Forest) on Louis Moult (Bradford). Direct free kick taken right-footed by Jon McLaughlin (Bradford) from own half, resulting in open play. 118:16 Defending throw-in by Luke O'Brien (Bradford). 117:13 Shot by Dexter Blackstock (Nottm Forest) drilled left-footed from left side of penalty area (12 yards), save (caught) by Jon McLaughlin (Bradford). 116:22 Cross by Garath McCleary (Nottm Forest), header by Dele Adebola (Nottm Forest) from centre of penalty area (12 yards), over the bar. Goal kick taken long by Jon McLaughlin (Bradford). 116:16 Attacking throw-in by Paul McKenna (Nottm Forest). 115:21 Cross by Nathan Tyson (Nottm Forest), save (caught) by Jon McLaughlin (Bradford). 113:58 Shot by Nathan Tyson (Nottm Forest) drilled left-footed from right channel (25 yards), over the bar. Goal kick taken long by Jon McLaughlin (Bradford). 113:26 Foul by James Hanson (Bradford) on Chris Cohen (Nottm Forest). Direct free kick taken left-footed by Chris Cohen (Nottm Forest) from own half, passed. 113:05 Attacking throw-in by Zesh Rehman (Bradford). 112:05 Attacking throw-in by Luke O'Brien (Bradford). 111:49 Goal kick taken long by Jon McLaughlin (Bradford). 111:01 Outswinging corner from left by-line taken left-footed by Chris Cohen (Nottm Forest) to far post, shot by Luke Chambers (Nottm Forest) volleyed right-footed from right side of penalty area (12 yards), save (parried) by Jon McLaughlin (Bradford). 110:34 Shot by Jake Speight (Bradford) volleyed right-footed from right side of penalty area (18 yards), save (caught) by Lee Camp (Nottm Forest). 109:55 Foul by Chris Cohen (Nottm Forest) on Dave Syers (Bradford). Direct free kick taken right-footed by Zesh Rehman (Bradford) from own half, resulting in open play. 109:47 Attacking throw-in by Garath McCleary (Nottm Forest). 109:18 Defending throw-in by Luke O'Brien (Bradford). 108:30 Inswinging corner from left by-line taken right-footed by Paul McKenna (Nottm Forest) to near post, clearance by Shane Duff (Bradford). 107:40 Jake Speight (Bradford) caught offside. Indirect free kick taken right-footed by Wes Morgan (Nottm Forest) from own half, resulting in open play. 107:20 Outswinging corner from left by-line taken left-footed by Dele Adebola (Nottm Forest) to far post, clearance by Steve Williams (Bradford). 106:14 Defending throw-in by Luke Chambers (Nottm Forest). 105:00+0:08 Goal kick taken long by Lee Camp (Nottm Forest). 103:56 Foul by Luke Chambers (Nottm Forest) on Jake Speight (Bradford). Free kick drilled right-footed by Simon Ramsden (Bradford) from right channel (20 yards), hit wall. 101:58 Defending throw-in by Garath McCleary (Nottm Forest). 100:35 Substitution Nottm Forest substitution: Joel Lynch replaced by Paul McKenna (tactical). 97:54 GOAL - James Hanson:Bradford 2 - 1 Nott'm Forest Goal by James Hanson (Bradford) right-footed (bottom-left of goal) from left side of six-yard box (6 yards).Bradford 2-1 Nottm Forest. 97:54 Foul by Joel Lynch (Nottm Forest) on Jake Speight (Bradford). Direct free kick taken left-footed by Simon Ramsden (Bradford) from right channel, shot by Luke O'Brien (Bradford) drilled left-footed from right channel (18 yards), blocked by Luke Chambers (Nottm Forest). 96:48 Shot by Matt Thornhill (Nottm Forest) drilled right-footed from right channel (20 yards), missed left. Goal kick taken long by Jon McLaughlin (Bradford). 95:27 Defending throw-in by Luke O'Brien (Bradford). 94:40 Shot by Louis Moult (Bradford) drilled right-footed from left side of penalty area (18 yards), over the bar. Goal kick taken long by Lee Camp (Nottm Forest). 93:12 Defending throw-in by Luke Chambers (Nottm Forest). 92:30 Shot by Nathan Tyson (Nottm Forest) drilled right-footed from left channel (20 yards), over the bar. Goal kick taken long by Jon McLaughlin (Bradford). 90:27 Goal kick taken long by Jon McLaughlin (Bradford). 90:00+4:00 Goal kick taken long by Lee Camp (Nottm Forest). 90:00+3:51 Drilled header by James Hanson (Bradford) from left side of penalty area (12 yards), over the bar. 90:00+3:02 Attacking throw-in by Simon Ramsden (Bradford). 90:00+2:11 Shot by Chris Cohen (Nottm Forest) left-footed from left channel (12 yards), save (parried) by Jon McLaughlin (Bradford). 90:00+1:47 Attacking throw-in by Luke Chambers (Nottm Forest). 90:00+0:26 Outswinging corner from left by-line taken left-footed by Chris Cohen (Nottm Forest) to far post, save (caught) by Jon McLaughlin (Bradford). 89:17 Shot by Chris Cohen (Nottm Forest) left-footed from right channel (25 yards), save (caught) by Jon McLaughlin (Bradford). 88:50 Outswinging corner from right by-line taken right-footed by Matt Thornhill (Nottm Forest) to far post, resulting in open play. 87:40 Defending throw-in by Zesh Rehman (Bradford). 86:15 Foul by Wes Morgan (Nottm Forest) on James Hanson (Bradford). Direct free kick taken right-footed by Jake Speight (Bradford) from left channel, resulting in open play. 85:33 Outswinging corner from left by-line taken left-footed by Chris Cohen (Nottm Forest) to far post, save (caught) by Jon McLaughlin (Bradford). 84:58 Defending throw-in by Luke Chambers (Nottm Forest). 82:38 Defending throw-in by Luke Chambers (Nottm Forest). 82:18 Attacking throw-in by Luke O'Brien (Bradford). 81:19 Header by Luke Chambers (Nottm Forest) from left channel (12 yards), save (caught) by Jon McLaughlin (Bradford). 80:05 Goal kick taken long by Jon McLaughlin (Bradford). 78:43 Booking Steve Williams (Bradford) booked for unsporting behaviour. 78:43 Foul by Steve Williams (Bradford) on Nathan Tyson (Nottm Forest). Direct free kick taken left-footed by Chris Cohen (Nottm Forest) from left channel, resulting in open play. 77:58 Attacking throw-in by Chris Cohen (Nottm Forest). 77:10 Foul by Zesh Rehman (Bradford) on Dexter Blackstock (Nottm Forest). Direct free kick taken left-footed by Chris Cohen (Nottm Forest) from left wing, resulting in open play. 76:58 Foul by Jake Speight (Bradford) on Chris Cohen (Nottm Forest). Direct free kick taken left-footed by Chris Cohen (Nottm Forest) from own half, resulting in open play. 75:51 Inswinging corner from left by-line taken left-footed by Chris Cohen (Nottm Forest) to centre, clearance by Simon Ramsden (Bradford). 75:21 Shot by Nathan Tyson (Nottm Forest) left-footed from left channel (12 yards), hit post. 74:56 Shot by Louis Moult (Bradford) left-footed from left channel (20 yards), save (caught) by Lee Camp (Nottm Forest). 74:48 Attacking throw-in by Luke O'Brien (Bradford). 73:57 Defending throw-in by Zesh Rehman (Bradford). 73:28 Outswinging corner from left by-line taken right-footed by Simon Ramsden (Bradford) to far post, resulting in open play. 73:12 Cross by Louis Moult (Bradford), clearance by Dele Adebola (Nottm Forest). 72:13 Goal kick taken long by Lee Camp (Nottm Forest). 71:48 Substitution Nottm Forest substitution: Paul Anderson replaced by Dele Adebola (tactical). 71:35 Substitution Nottm Forest substitution: Lewis McGugan replaced by Dexter Blackstock (tactical). 71:19 Shot by Jake Speight (Bradford) right-footed from left channel (18 yards), missed left. 70:44 Attacking throw-in by Zesh Rehman (Bradford). 70:25 Shot by Louis Moult (Bradford) right-footed from left channel (18 yards), blocked by Wes Morgan (Nottm Forest). 68:38 Attacking throw-in by Luke Chambers (Nottm Forest). 67:33 Inswinging corner from right by-line taken left-footed by Chris Cohen (Nottm Forest) to near post, clearance by Zesh Rehman (Bradford). 64:46 Foul by Simon Ramsden (Bradford) on Lewis McGugan (Nottm Forest). Direct free kick taken right-footed by Lewis McGugan (Nottm Forest) from right channel, passed. 64:04 Goal kick taken long by Jon McLaughlin (Bradford). 63:37 Shot by Paul Anderson (Nottm Forest) right-footed from left side of penalty area (18 yards), missed right. 62:16 Defending throw-in by Chris Cohen (Nottm Forest). 61:35 Garath McCleary (Nottm Forest) caught offside. Indirect free kick taken right-footed by Jon McLaughlin (Bradford) from own half, resulting in open play. 60:44 Attacking throw-in by Luke O'Brien (Bradford). 59:08 Foul by Nathan Tyson (Nottm Forest) on Zesh Rehman (Bradford). Direct free kick taken right-footed by Jon McLaughlin (Bradford) from own half, resulting in open play. 58:26 Goal kick taken long by Jon McLaughlin (Bradford). 56:13 Assist by Jake Speight (Bradford) from left side of penalty area. 56:13 GOAL - Dave Syers:Bradford 1 - 1 Nott'm Forest Goal by Dave Syers (Bradford) left-footed (bottom-right of goal) from left side of penalty area (20 yards).Bradford 1-1 Nottm Forest. 55:34 Defending throw-in by Luke Chambers (Nottm Forest). 54:13 Goal kick taken long by Jon McLaughlin (Bradford). 53:42 Shot by Nathan Tyson (Nottm Forest) left-footed from right side of penalty area (12 yards), missed left. 51:54 Goal kick taken long by Jon McLaughlin (Bradford). 51:02 Attacking throw-in by Chris Cohen (Nottm Forest). 50:12 Attacking throw-in by Luke O'Brien (Bradford). 49:51 Attacking throw-in by Luke O'Brien (Bradford). 49:05 Shot by Nathan Tyson (Nottm Forest) right-footed from left side of penalty area (12 yards), save (caught) by Jon McLaughlin (Bradford). 48:29 Corner from right by-line taken short right-footed by Garath McCleary (Nottm Forest). 48:21 Goal kick taken long by Lee Camp (Nottm Forest). 47:38 Attacking throw-in by Simon Ramsden (Bradford). 46:53 Booking Garath McCleary (Nottm Forest) booked for unsporting behaviour. 46:53 Foul by Garath McCleary (Nottm Forest) on James Hanson (Bradford). Direct free kick taken right-footed by Shane Duff (Bradford) from own half, resulting in open play. 45:43 Inswinging corner from right by-line taken left-footed by Chris Cohen (Nottm Forest) to near post, clearance by James Hanson (Bradford). 45:29 Shot by Lewis McGugan (Nottm Forest) drilled right-footed from right side of penalty area (12 yards), save (with feet) by Jon McLaughlin (Bradford). 45:14 Attacking throw-in by Chris Cohen (Nottm Forest). 45:01 Substitution Bradford substitution: Scott Neilson replaced by Simon Ramsden (tactical). 45:01 Substitution Bradford substitution: Omar Daley replaced by James Hanson (tactical). 45:01 Substitution Bradford substitution: Lee Bullock replaced by Dave Syers (tactical). 45:00+0:40 Jake Speight (Bradford) caught offside. Indirect free kick taken right-footed by Lee Camp (Nottm Forest) from own half, resulting in open play. 45:00+0:24 Goal kick taken long by Lee Camp (Nottm Forest). 45:00+0:06 Shot by Louis Moult (Bradford) right-footed from right channel (30 yards), missed left. 44:09 Attacking throw-in by Omar Daley (Bradford). 43:17 Goal kick taken long by Jon McLaughlin (Bradford). 42:41 Inswinging corner from left by-line taken right-footed by Lewis McGugan (Nottm Forest) to far post, resulting in ball out of play. 42:16 Shot by Matt Thornhill (Nottm Forest) right-footed from left channel (20 yards), blocked by Scott Neilson (Bradford). 41:58 Attacking throw-in by Chris Cohen (Nottm Forest). 41:18 Attacking throw-in by Zesh Rehman (Bradford). 40:03 Defending throw-in by Luke O'Brien (Bradford). 39:42 Goal kick taken long by Jon McLaughlin (Bradford). 39:27 Shot by Guy Moussi (Nottm Forest) left-footed from right channel (20 yards), over the bar. 38:22 Defending throw-in by Zesh Rehman (Bradford). 37:33 Foul by Chris Cohen (Nottm Forest) on Tommy Doherty (Bradford). Direct free kick taken right-footed by Steve Williams (Bradford) from own half, resulting in open play. 36:09 Foul by Luke O'Brien (Bradford) on Garath McCleary (Nottm Forest). Direct free kick taken left-footed by Chris Cohen (Nottm Forest) from right wing, resulting in open play. 34:51 Assist (cross) by Chris Cohen (Nottm Forest) from left by-line. 34:51 GOAL - Matt Thornhill:Bradford 0 - 1 Nott'm Forest Goal by Matt Thornhill (Nottm Forest) right-footed (bottom-left of goal) from right side of penalty area (6 yards).Bradford 0-1 Nottm Forest. 32:57 Foul by Joel Lynch (Nottm Forest) on Jake Speight (Bradford). Direct free kick taken left-footed by Luke O'Brien (Bradford) from right wing, header by Steve Williams (Bradford) from centre of penalty area (12 yards), over the bar. 30:19 Shot by Lewis McGugan (Nottm Forest) right-footed from left channel (25 yards), save (caught) by Jon McLaughlin (Bradford). 29:03 Inswinging corner from right by-line taken left-footed by Chris Cohen (Nottm Forest) to near post, clearance by Steve Williams (Bradford). 27:58 Attacking throw-in by Zesh Rehman (Bradford). 26:48 Defending throw-in by Chris Cohen (Nottm Forest). 26:05 Inswinging corner from right by-line taken right-footed by Chris Cohen (Nottm Forest) to far post, resulting in open play. Correction - 26:05 Inswinging corner from right by-line taken left-footed by Chris Cohen (Nottm Forest) to far post, resulting in open play. 25:36 Shot by Scott Neilson (Bradford) right-footed from left side of penalty area (6 yards), save (parried) by Lee Camp (Nottm Forest). 25:06 Goal kick taken long by Jon McLaughlin (Bradford). 24:27 Attacking throw-in by Luke O'Brien (Bradford). 24:07 Goal kick taken short by Jon McLaughlin (Bradford). Correction - 22:45 Goal kick taken short by Jon McLaughlin (Bradford). 22:45 Goal kick taken long by Jon McLaughlin (Bradford). 22:34 Attacking throw-in by Luke Chambers (Nottm Forest). 22:00 Goal kick taken long by Lee Camp (Nottm Forest). 21:23 Goal kick taken long by Lee Camp (Nottm Forest). 21:08 Shot by Omar Daley (Bradford) right-footed from left channel (20 yards), missed right. 20:27 Defending throw-in by Zesh Rehman (Bradford). 17:55 Foul by Chris Cohen (Nottm Forest) on Scott Neilson (Bradford). Direct free kick taken right-footed by Scott Neilson (Bradford) from right channel, resulting in open play. 17:15 Defending throw-in by Luke Chambers (Nottm Forest). 16:56 Defending throw-in by Luke O'Brien (Bradford). 16:21 Goal kick taken long by Lee Camp (Nottm Forest). 16:08 Shot by Omar Daley (Bradford) right-footed from right channel (20 yards), missed right. 15:29 Outswinging corner from right by-line taken right-footed by Scott Neilson (Bradford) to near post, resulting in open play. 15:11 Shot by Jake Speight (Bradford) right-footed from right channel (12 yards), blocked by Lewis McGugan (Nottm Forest). 14:37 Foul by Wes Morgan (Nottm Forest) on Jake Speight (Bradford). Direct free kick taken right-footed by Tommy Doherty (Bradford) from right channel, resulting in open play. 14:04 Foul by Luke Chambers (Nottm Forest) on Omar Daley (Bradford). Direct free kick taken right-footed by Shane Duff (Bradford) from own half, resulting in open play. 13:40 Defending throw-in by Zesh Rehman (Bradford). 13:28 Defending throw-in by Zesh Rehman (Bradford). 12:35 Defending throw-in by Zesh Rehman (Bradford). 12:03 Goal kick taken long by Jon McLaughlin (Bradford). 11:45 Shot by Matt Thornhill (Nottm Forest) right-footed from left channel (18 yards), missed left. 10:19 Goal kick taken long by Jon McLaughlin (Bradford). 9:32 Attacking throw-in by Zesh Rehman (Bradford). 9:09 Defending throw-in by Zesh Rehman (Bradford). 8:35 Defending throw-in by Zesh Rehman (Bradford). 8:07 Defending throw-in by Luke O'Brien (Bradford). 7:40 Attacking throw-in by Scott Neilson (Bradford). 6:36 Inswinging corner from left by-line taken right-footed by Omar Daley (Bradford) to far post, clearance by Lewis McGugan (Nottm Forest). 5:43 Attacking throw-in by Chris Cohen (Nottm Forest). 5:26 Defending throw-in by Luke Chambers (Nottm Forest). 4:57 Attacking throw-in by Chris Cohen (Nottm Forest). 3:36 Attacking throw-in by Zesh Rehman (Bradford). 3:09 Defending throw-in by Zesh Rehman (Bradford). 2:46 Attacking throw-in by Zesh Rehman (Bradford). 2:25 Attacking throw-in by Zesh Rehman (Bradford). 1:52 Attacking throw-in by Luke O'Brien (Bradford). 1:23 Goal kick taken long by Jon McLaughlin (Bradford). 1:04 Shot by Guy Moussi (Nottm Forest) left-footed from right channel (20 yards), missed left. 0:18 Defending throw-in by Luke O'Brien (Bradford). Extra time ends and the game is over.